A helicopter from BH Helicopter in Rockerville prepares to aid in the search for Serenity Dennard. ROCKERVILLE, S.D. 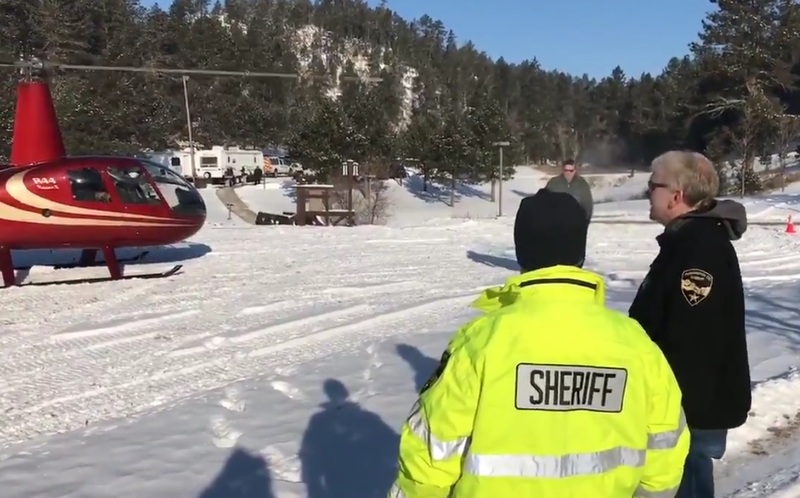 - Despite cold temperatures and a lot of fresh snow, search and rescue teams were out early Saturday morning looking for a 9-year-old girl who has been missing since Sunday. Serenity Dennard disappeared after she ran away from staff members at the Black Hills Children's Home near Rockerville. Since Wednesday, rescuers had called their operation a recovery effort -- assuming Serenity did not get picked up or found someplace warm. With temperatures well below zero this week, any hopes of finding her alive if she remained outside were gone. After the weather resulted in shutting down search operations Thursday and Friday, crews were in full force today hoping to locate the little girl. Added to the mix were seven dog teams, a helicopter and a number of people taking part. The specialized dog teams come from Iowa, Colorado and Wyoming. They specialize in picking up scents in harsh conditions. However, the extreme cold does mean the dogs must work in shifts. They can only be out for so long before they too, need to come back to base camp and warm up. The helicopter being used today was graciously donated by Mike Jacobs of Rushmore Helicopters. Two spotters from the Pennington County Sheriff's Office are on the chopper, which is using a make-shift landing pad at the Black Hills Children's Home. Jacobs says he's pleased to be able to help with the effort. The Gaslight Restaurant in Rockerville was also helping today -- offering to feed those helping in the search for Serenity. In a release, the Pennington County Sheriff's Office says: Finding Serenity remains a top priority of the Pennington County Sheriff’s Office. We have an active investigation with investigators from the Sheriff’s Office and detectives from the Police Department dedicated to following up on all leads. If anyone has seen or had contact with Serenity, do not communicate that information via social media. Please contact the Pennington County Sheriff’s Office at (605) 394-6115.